This $249 portable SSD is built to withstand hard drops and raindrops alike. 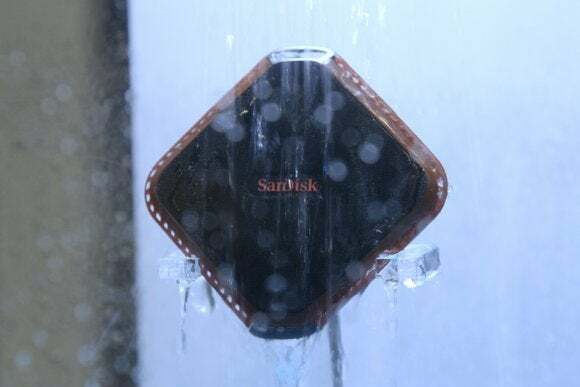 SanDisk's Extreme 510 Portable SSD feeds a love and a need: We all love fast, compact SSDs, and our portable storage needs are outstripping the capacity of the typical USB key drive. The Extreme 510 packs 480GB of sweet SSD storage into a small, square, slender package. You'll notice the rubber gasket surrounding it, which is part of the physical protection built into the drive, so you can carry it in your pocket or pack with some sense of security against drops or other accidents. SanDisk also throws in data protection, in the form of its SecureAccess software for encrypting files stored on the drive. For a klutzy person like me, a durable drive like the Extreme 510 is a more sensible and economical choice than leaving a wake of zapped, bent, or otherwise ruined USB drives behind me, as is my tendency. Economical is relative, though. USB drives have become so cheap, you could easily get a 256GB model for $50 or $60. The Extreme 510 costs $249 for 480GB, a significant uptick in cost per gigabyte. At Mobile World Congress, I had a brief feeling of freedom from my storage-destructive ways. I gleefully dropped an Extreme 510 SSD over and over. We all watched as another stoic drive endured repeated dousings of water. You wouldn't want to make a habit of such abuse, but if you're rough on your stuff, this kind of drive has a better chance of survival.